The wonderful house is conveniently located just one block from Main and an easy walk to Marktplatz, shopping and restaurants. 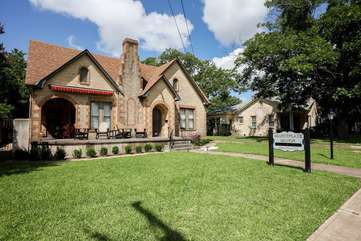 Being in the historic district, guests will find this Tudor style home built in 1927 full of memories in its architecture and the many period built in features found inside the house. Three bedrooms are found in this elegant home. Two bedrooms are both elegant and spacious. Each bedroom offers a uniquely and tastefully appointed King bed along with 42” flat screen TVs. A private bath for the two bedrooms has a tiled shower and pedestal sink. The third bedroom invites you to enjoy the King size bed with pillow top mattress and the 42’ flat screen television with cable found in the armoire. A comfortable chair and ottoman are perfect for reading or just relaxing. This room offers a private vintage bath with a tub/shower combination. The living/dining room is both breathtakingly beautiful and comfortable for guests to enjoy and cherish whether it be your family during the holidays or friends creating wonderful new memories. The Tuscan red living room offers elegant and comfy seating. There is also a spacious dining room with a 55” flat screen TV plus a full kitchen with two additional dining areas. There is a sleeper sofa in the living room. There is also a single sleeper in the Baroness-Empress bedroom. This house is a wonderful property to enjoy family and friend weekends plus is conveniently located to just about everything. Enjoyed our stay. Comfy beds and nicely furnished. Plenty of towels and all of the amenities needed. Convenient to town. Easy walk to restaurants and shops.Hope to be back soon. We stayed at the Manor for two nights. The house was loved by all. The bedrooms were great, kitchen, dining and living rooms was all decorated very nicely. The beds were very comfy. So nice to just walk to main street.